See this text? It's a gratuitous waste of GeekGold. The game itself isn't important. Spending time intellectually jousting with likeminded folks is the real reason to game. For those unfamiliar, a cooperative game is any game in which players do not compete against each other, but instead work together against an "engine" of some kind provided by the game, which generates challenges for them to overcome. As always, this list represents my personal top ten list of cooperative games, not BoardGameGeek's. Though there is significant overlap, this list does not exactly match BGG's list. The Lord of the Rings: The Card Game is a customizable card game for one to four players set in the Lord of the Rings universe as devised by J.R.R. Tolkien. The game was designed by Nate French and Caleb Grace, published by Fantasy Flight Games, and a single scenario is playable in about half an hour. In Lord of the Rings, players pilot a team of three Heroes as they attempt to complete a Quest. Keeping the players from completing the quest is an Encounter deck, which generates threats for the players to contend with. However, the heroes generate a resource each turn and the players can use those resources to bring out allies, equipment, and events to help the heroes. 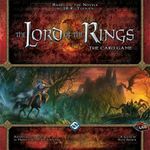 Lord of the Rings stands out to me because of the wide variety of scenarios available, the difficulty of many of those scenarios (requiring some degree of customization of the player deck), and the rich theme that's well represented, plus it is perhaps the best solo gaming experience I've ever had. Sentinels of the Multiverse is a superhero-themed card game for one to four players, designed by Christopher Badell, Paul Bender, and Adam Rebottaro, published by Greater Than Games, and playable in forty five minutes or so. Sentinels evokes the feeling of a comic superhero battle much better than the games actually licensed by comic companies by giving each player a unique superhero deck and having them fight against an AI villain deck as a team (along with an environment deck). The game works because of the surprising variety in the heroes, villains, and environments in the game, creating the type of variety you'd hope to see from a large complement of different comic book lines. The basic rules are straightforward enough that my seven year old can play, but the game choices require enough nuance that experienced gamers will have difficulty with some of the harder villain and environment pairings. Hanabi is a clever little card game for two to five players, designed by Antoine Bauza, published by Asmodee and ABACUSSPIELE, and playable in about half an hour. In Hanabi, each player has a hand of cards that's revealed to all other players except themselves and must, through teamwork, collectively play these cards to the table in the right order. Hanabi really stands out for me because it solves the "dominant player" problem that many cooperative games have in an incredibly elegant fashion. In Hanabi, players are sharply restricted on the amount and type of information they can share with one another. The sharing of specific "clues" is one of the primary mechanisms of the game, and those "clues" are the only way to share or discuss game information. 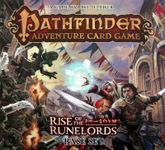 Pathfinder Adventure Card Game is a fantasy adventure themed card game for one to six players, designed by Mike Selinker, published by Paizo, and playable in about an hour per scenario. In PACG, you take on the role of a specific hero with a loosely defined "recipe" for a deck, which you assemble before your first adventure. As you progress through the adventures in your game, you receive upgrades for your deck, gradually improving your character over time. PACG's appeal really comes from this character growth, as you become attached to your character's specialized abilities and you enjoy seeing how your character, grown over the course of several scenarios, can take on this latest one. 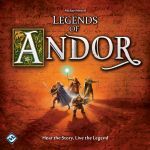 Legends of Andor is a fantasy adventure themed board game for two to four players (although it is playable solo), designed by Michael Menzel, published by Fantasy Flight Games, and playable in a little over an hour. In Legends of Andor, you play one member of a band of heroes attempting to rid the land of an invading horde. Legends of Andor stands out in several ways: the unique way in which the rules gradually reveal themselves through gameplay (with the first two scenarios essentially acting as a game tutorial), the deep puzzle-like nature of the scenarios, and the use of time as a key mechanism in the gameplay, as moves have a time cost and you have only so many hours in the day. 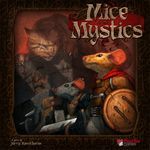 Mice and Mystics is a dungeon crawling game for two to four players. It's designed by Jerry Hawthorne, published by Plaid Hat Games, and is playable in a little over an hour. In Mice and Mystics, you play one of a team of mice attempting to overcome the obstacles in a particular scenario - monsters, mysteries, and the like. The game is held together over a series of scenarios by a wonderful overarching story. In fact, that's the real strength of Mice and Mystics - it does a fantastic job of telling an engaging fantasy story. The game's style, that of a dungeon crawl with monsters controlled by a very simple AI, is simple enough that it can really work well as a family game. Pandemic is an epidemic-themed board game for two to four players (though it can be played solo). It's designed by Matt Leacock, published by Z-Man Games, and playable in a little over an hour. In Pandemic, you play the role of one member of a team of scientists attempting to eradicate a set of diseases that are eradicating the board. The "AI" of these diseases is controlled by a location deck of which the top few cards are revealed each turn and which indicate places on the board (a world map) where a particular disease spreads. Players must work cooperatively to not only cure the diseases, but prevent the diseases from spreading out of control. Pandemic is often cited as a "gateway" cooperative game, and for good reason - it has approachable rules and requires a collaborative approach to victory with everyone playing a sizable role. 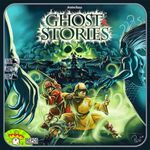 Ghost Stories is a Taoist-themed cooperative game for two to four players (though it's playable solo), designed by Antoine Bauza, published by Asmodee, and playable in an hour. In Space Cadets, each player is a Taoist monk trying to protect a village from an enormous influx of ghosts. The monks do this by moving around a 3x3 grid of tiles representing the village, activating the abilities of those tiles, and fighting the ghosts as they approach the outer rows and columns of the village. Ghost Stories provides some very intense difficulty, lots of great tactical decisions, and a very engaging theme to make it a co-op that I keep coming back to. 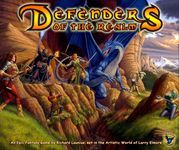 Defenders of the Realm is a fantasy-themed cooperative game for one to four players, designed by Richard Launius, published by Eagle Games, and playable in an hour and a half. In Defenders of the Realm, players take on the role of a Hero who, in concert with the other Heroes, strives to cleanse the darkness from the land. Defenders does a great job of capturing the cooperative Pandemic game style (with a deck indicating locations on the board where bad things happen) while adding a bit of additional depth (with quests and uncertain combat) without adding too much complexity. 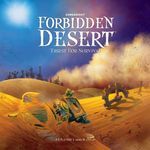 Forbidden Desert is a desert exploration game for one to five players, designed by Matt Leacock, published by Gamewright, and playable in about forty five minutes. In Forbidden Desert, you take on the role of an adventurer who has crashed in the desert and, along with the rest of the team, needs to recover the pieces of the airship so that they can leave. The desert is fraught with dangers and obstacles which are generated by a roving desert storm, which is itself controlled by a deck with cards that describe the movement of the storm. Players must dig out locations buried by the sandstorm to get clues as to the location of the ship parts, recover those parts, and return to the ship before they die of thirst. Forbidden Desert is perhaps the most family-accessible game on this list, but still retains more than enough challenges to push all levels of gamers.